This resource has been designed to complement the teaching of the 'Adventure Model', a useful model found in both the No Limits and UnLimited programs. 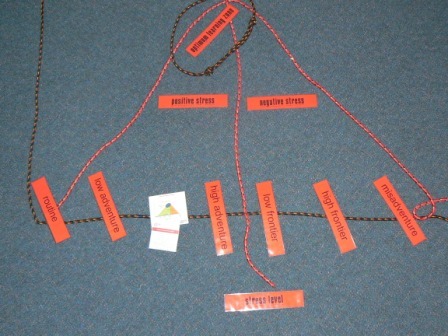 The 'Adventure Model' provides an excellent visual reference to understand the different responses people experience in various stressful situations. Consisting of a variety of ropes and labels, this kit provides an interactive and novel way to present this model to participants. Kit includes: Variety of ropes, durable laminated labels, diagram model and kit contents card, all presented in a carry bag.